I've started out this note with a white lie. This is about astrophotography with only a camera and lens, where the lens functions as a telescope. My Getting Started note covers the basics of how find a camera that you can use. Here I describe in more detail the other portable equipment that I use to capture deep sky objects without a telescope. 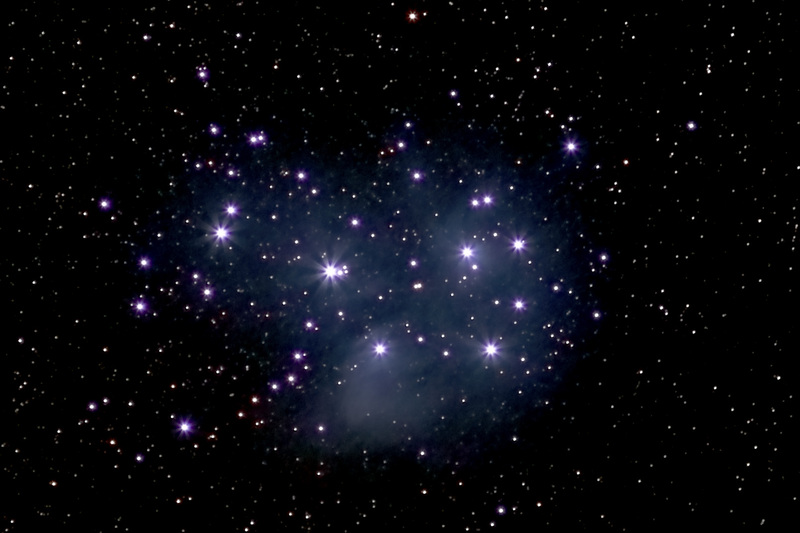 The Pleiades no telescope required, with a Sony a6300 camera, Vivitar 135mm f2 telephoto lens, and Vixen Polarie tracking mount. 11 minutes of 30 sec exposures at ISO 2500 at f4. Stacking in Nebulosity and stretching in Photoshop. An f2 telephoto lens will capture an image 16 times faster than an f8 telescope with a much simpler and lighter kit. These images may require many minutes of exposure, more than is needed for wide field of view nightscape images on a fixed tripod. 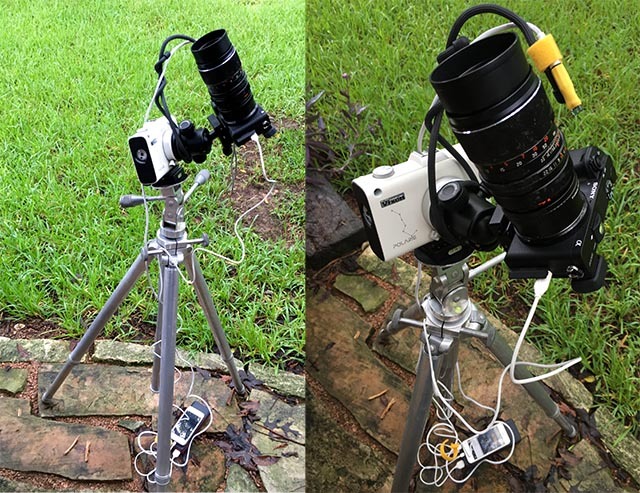 Adding a motorized star tracker allows you to take the required long exposure images with a telephoto lens. For exposures longer than a couple of minutes, shorter exposures can be stacked in post processing. Camera - My recommendation is to start with a camera that you already have. For DSOs a camera needs to have a telephoto lens. See Getting Started for the other features that will make taking astrophotographs easier. Learn how to take the best images that you can with it. When you can't progress any more, the next step needed will be much clearer. I use a mirrorless camera in my kit for two reasons: light weight and lens selection. Because of their short flange to sensor distance almost any manual lens can be easily used. Vintage manual lenses are very inexpensive and many are well suited to astrophotography. The next image shows what can be done with a telephoto with a full frame equivalent focal length of 200mm. 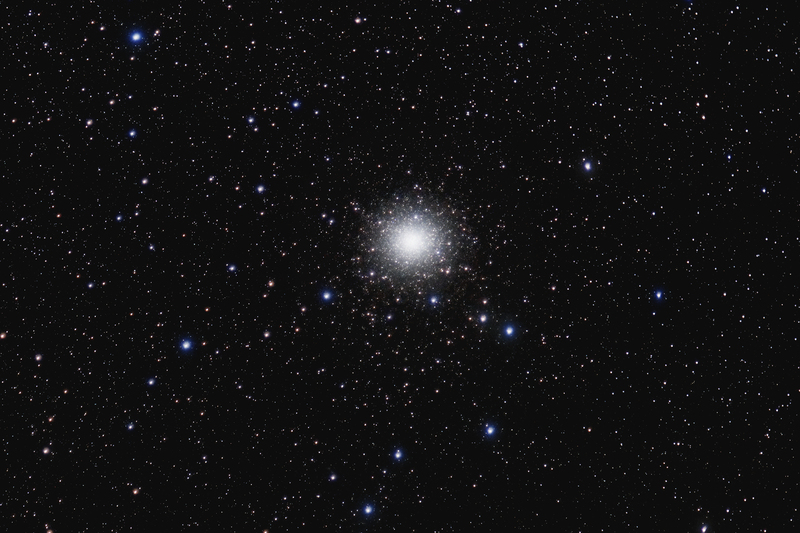 Omega Centauri - ghost of a galaxy from Terlingua, a Texas ghost town. Sony NEX-5N with vintage Vivitar 135mm f 2.8 telephoto lens. 21 images exposed for 10 sec each at ISO 6400 stacked in Nebulosity and cropped and exposure adjusted in Photoshop. Tripod - A sturdy tripod intended for a medium format or video camera will serve well. My vintage, made in New Jersey, Marchioni Tiltall works well for me. A pan and tilt head is all that is needed to mount and align the tracker. A small adjustable astronomical wedge will work well too. It needs to support your tracker, ball head, camera, and heaviest lens. Weigh these and make sure the load capacity of the tripod has plenty of reserve (50%). Tracker - The tracker needs to support weight of camera, your heaviest lens, and ball head with some margin for safety. My Vixen Polarie works well with my mirrorless camera, sturdy ball head, and 135 mm lens and is very compact and robust. If you have a heavy DSLR and 300mm lens you will probably need a larger heavier alternative. OPT AstroTrac, Sky-Watcher Star Adventurer, and iOptron SkyTracker are alternatives. Some of these will allow the use of counterweights to balance heavy loads. Ball head - You need one to mount and aim the camera from the tracker. It needs to support your camera and heaviest lens while still being easy to adjust. I found a good one from XCSource on-line for a fraction of the name brands. Motion during tracking is handled by the mount, the ball head is used only for aiming and ultra smooth panning isn't required. Intervalometer - The lightest option is a good one built into your camera. Make sure it is reliable. If you need an external one, there are dedicated units as well as very flexible apps that will run on a smart phone. You will probably need a cable that connects your headphone jack to a pair of infrared diodes. Commercial ones are available or it is easy to make your own if you can solder. This image was made with a 90 mm full frame equivalent telephoto lens. 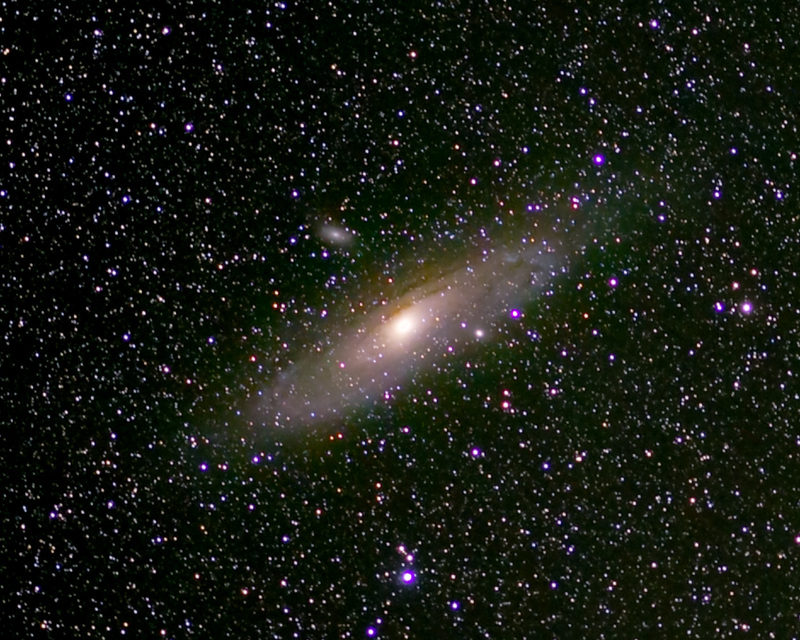 Andromeda Galaxy 2014-08-14 from Marathon Texas Revisited - No telescope required to see another galaxy. M31, under spectacular skies from Marathon, Texas. M110 is at 11 o'clock and M32 at 4. Reprocessed paying more attention to bring out color and resolution enhanced 50% by drizzle stacking. Sony NEX-5N with Sigma 60mm f2.7 lens & Vixen Polarie star tracker. 30 minutes total exposure with 15 lights and 4 dark frames. Stacking & NR in Nebulosity with stretching and sharpening in Photoshop. Batteries - four to six hours will easily outlast many battery powered cameras and trackers. It is nearly impossible to change batteries in the middle of a photographic sequence without spoiling your aim. External batteries are a perfect choice to resolve this problem, if your equipment operates with external battery power. Caution: many cameras will charge their batteries in case from external power, but will not operate at the same time. Fortunately my camera, tracker, and intervalometer will all operate from external 5V USB style power. I use an inexpensive rechargeable battery pack with 3 USB power outputs that will power all three for several nights. If the external battery ever runs low, it is simple to swap it out at the end of the power cable. The internal batteries in the camera, tracker, etc. will keep them running while you switch external batteries. Cables and ties - You will need power cables with the right connectors for your batteries, and equipment. Ties are used to relive stress and keep cables from flopping with the wind. If you use an IR wireless intervalometer you will want to secure the IR transmitter end so that the cameras IR sensor remains in view throughout your photo session. Wireless remote - A wireless camera remote is very handy during setup while fine tuning your exposure and framing. Dew control - a chemical hand-warmer strapped to your lens, at the start of your imaging run, will do the job with the ultimate light weight. In central Texas conditions are usually dryer. I use a small separate 12v sealed lead acid battery and a 12V automotive hair dryer to keep the camera and lens warm and dry, if dew starts to form. Using a gentle blower allows you to remove dew and warm your lens without any chance disturbing your camera adjustment after you've started imaging. Commercial 12V battery units are available. It is easy to build a lighter higher capacity one yourself from a battery, cigarette lighter adapters, fuse, and wall charger. Enough 12V power with to run a dryer or other powered dew control equipment adds weight to the kit. I only bring it when I'm likely to use it. Caution: a long lens can be heavy. Keep all the screwed connections very tight, except for the one you are adjusting. It is easy for the camera mount or some other adjustment to loosen. At a minimum, you loose your framing. Worse, you can easily damage your equipment when it swings loose. 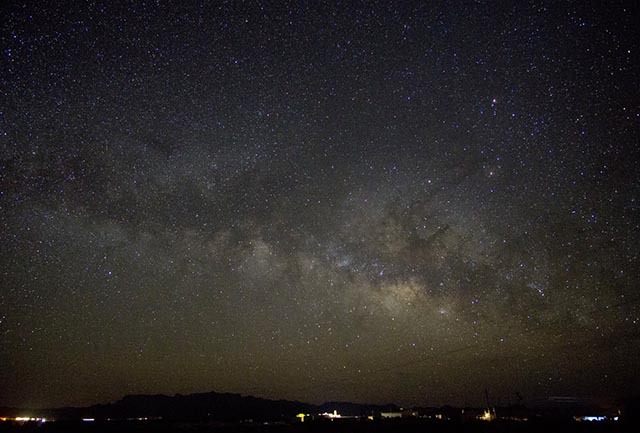 A tracking mount also adds new dimensions to your wide field of view nightscape images. 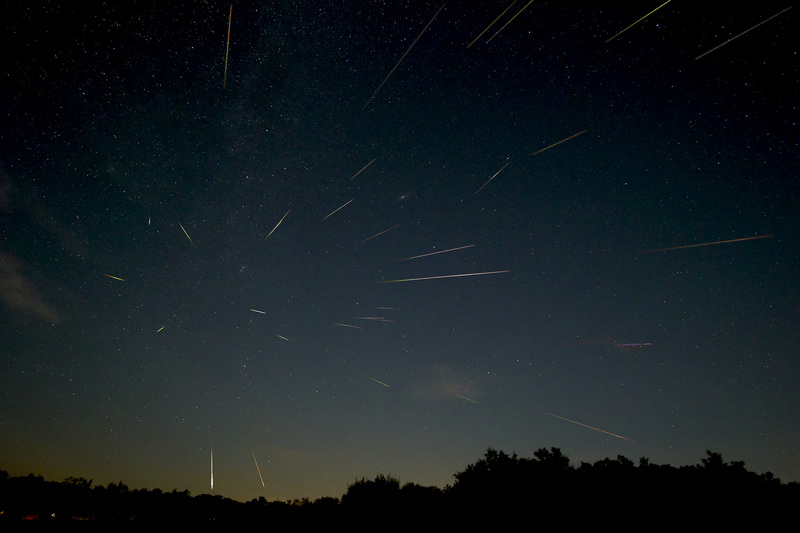 You can stack images for to improve image quality or to capture extended events like the Perseid meteor shower. The Perseids with Andromeda and the double cluster in Perseus. Shot over 7 hours the night of August 11-12, 2016 from west of Burnet, Texas. First to last meteor frame 3hrs 17 minutes. Sony a6300, with Rokinon f2 12mm lens, and Vixen Polarie tracking mount. Most images shot at f2.8 for 30 sec. at ISO 3200. 42 of 440 used, images aligned and some stacked in Nebulosity. Final composite and exposure adjustments in Photoshop. My kit shown assembled above easily fits in a small backpack (with the tripod strapped outside). This makes it easy to hike or bike to a dark spot with just the right view. Remember that the images you capture are just the start. Captured images need to be selected, aligned, stacked, stretched, poked and prodded to produce satisfying final images. I was amazed by the images I was able to take with this small kit. It can be hard to believe that these images were not taken with a large telescope. Amazing sights are right above our heads, just a bit too dim for our eyes to appreciate without a little help.